This is your chance to have a smiling Hayao Miyazaki standing on your desk. Bigshot Toyworks and illustrator Martin Hsu have opened preorders for a limited run of figurines in the image of acclaimed director Hayao Miyazaki. 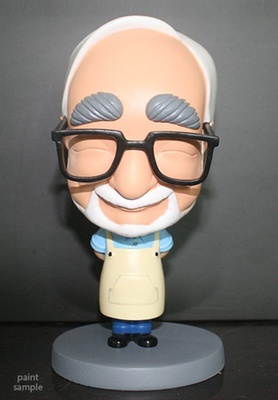 The figurine depicts a smiling Miyazaki in an apron. Each figurine costs $95, and only 300 are available. Preorders opened yesterday and will be open until Jan. 31. The figurine is expected to ship this April. It stands at 6 inches and is made of resin. Hsu created the figurine, nicknamed "Miya-san," as a special tribute to "a mentor in art and life." Miyazaki has directed several well-known animated films, such as Spirited Away, Princess Mononoke, and The Wind Rises, which was nominated for an Oscar. Sales of the Miya-san figurines will be donated to the Karakuwa-Maru organization to aid in the restoration of Karakuwa in Kesennuma City following the earthquake and tsunami that hit Japan in March 2011. Karakuwa-Maru encourages local residents to think about the future. Hsu also shared illustrations of what he imagines Miyazaki's future retirement to be like. The director has gone in and out of retirement in the past; however, he has said The Wind Rises is his last film. If he reverses that decision, it would be far from the first time he's done so. The legend never seems content to leave his career.